Rental Applications are also available on the Web Site Main Menu under “Forms”. Each pavilion is pictured at the bottom of this page. Locations of pavilions, restrooms, train, playgrounds, parking areas, 9-11 Tribute, etc. The 2019 Entertainment Schedule has arrived! See schedule below! in June, July and August  from 1-4 PM. (Also summer holidays). The parking lot at Red Run Park has been paved!!! The Township would like to thank the Rouzerville Business Association, and Mrs. Alma Oyer, who donated funding for this paving in honor of her husband, Nickson W. Oyer, the Blue Ridge Volunteer Fire & Rescue Squad and New Enterprise Stone & Lime Company for paving the parking lot in front of the 9/11 Tribute. Red Run Park provides live entertainment in our bandstand on weekends during the summer months. There is no fee. Just bring your lawn chair and enjoy the local and not-so-local talent of the musicians performing, usually from 1:00 to 4:00 p.m. each weekend. 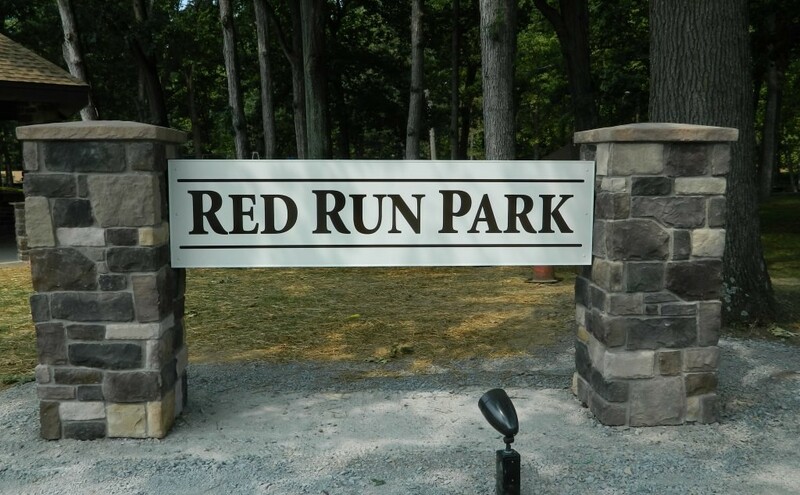 Red Run Park, the oldest park owned by Washington Township, is a 22 acre park that was presented to the Borough of Waynesboro in 1938 and subsequently in 1969 was conveyed to the Washington Township Supervisors as the property of Washington Township. The park consists of a man-made lake, picnic area, playground equipment, public restrooms, concession stand, and miniature train. The lake closed for swimming in the 1970’s, and has been used for fishing and ice skating since that time and is a very popular spot year round. A revitalization effort was affected at Red Run Park during the 1980’s. Monthly entertainment was initiated at the park, more equipment was provided, and a footbridge was added across the creek to invite further expansion into a new area of the park. A 1975 survey of Township residents provided the Township with a guide for future development of the park and long range planning is being utilized to develop Red Run Park in the best interest of the residents of Washington Township. Continued development of Red Run Park resulted in three major community events occurring at the park annually, construction of more picnic pavilions, special needs fishing pier and ramp to the pier, installation of a miniature train, tunnel and station. This train was previously operated at Cold Springs Park from the late 1920’s to 1970’s, and was installed at Red Run Park as part of the effort to save a unique portion of local history. The train and buildings were purchased and constructed by public contributions and are operated free of charge by volunteers. The 11 usable acres in this 22 acre park are essentially completely utilized at this time and the park management and upkeep of this park is by the Township.